This was another Young Adult fantasy novel that I had lying around my room, so I decided to give it a read, as I've been in a fantasy-type mood recently. Not that anyone would have noticed. 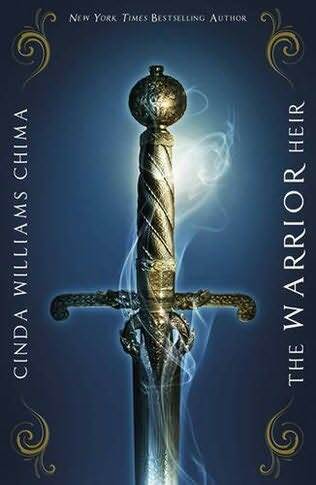 The Warrior Heir follows Jack Swift, a 16 year old boy who has spent his entire life in an unremarkable town in Ohio. He has had to take medicine for a heart condition ever since he can remember. It is only when he forgets to take his medicine one day that he realises that there might be something different about him: instead of feeling ill, he feels stronger and faster than he ever has before. It leads to the realisation that he is a warrior, a type of magical individual, prized for his incredible rarity and his innate talent for combat. As such, there are certain factions who will do anything to get their hands on him. Those of you who have followed my blog for a while will be familiar with my term "popcorn reading". For the newbies in the audience, allow me to explain: popcorn reading covers a sub-section of books that are entertaining and don't really require a huge amount of brain power. The Warrior Heir is one of those books. The characters are very solid and, where appropriate, touching. It is a touch simple, and there will be very little doubt as to whether a character is good, bad or somewhere in between: Garrett Lobeck, for example, is your stereotypical bully archetype and nothing more. Likewise, the plot is well-constructed and exciting in all the right places, even if some of the twists are a bit easy to figure out. I imagine it would be a good place to introduce someone to the fantasy genre, especially if they're teenagers or younger; there are a couple of sexual references that an audience in their teens or older will understand pretty quickly, but they're very subtle, so I can't see younger audiences catching on. Next review: The Falconer by Elizabeth May.